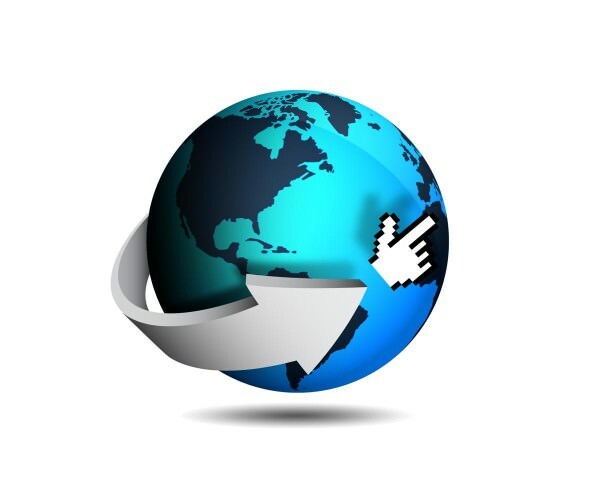 Today one of the “needs” of an individual is access to internet. It’s now a basic utility that the absence of it can bring withdrawal syndrome to some individuals. There are many dangers lurking around because of this access such that parents should be vigilant with their children’s premature and unlimited exposure, but there are undeniably significant benefits brought by the internet. I am a recipient of the wonders of internet. My work reaches individuals I could never have reached just a few years ago. It’s heartwarming to receive notes thanking me and telling me how they were affected by a piece I wrote, how they are now working to improve on some aspects of their parenting, womanhood, financial literacy, etc. The same goes for mails, which may disagree with me. I don’t know if it’s a midlife thing, but knowing that your work somehow affects others is important. Maybe it’s because at this stage, you want to make your existence more meaningful by being of help to others. One of the good things that the web brings about is connecting like-minded people you can do collaborative work with. A couple of months ago, I received an email from Moneymax.ph requesting for a meeting. They saw my body of work and deemed that it could be mutually beneficial to hook up. I had an initial meeting over coffee with Benedict Carandang, a Filipino who’s the Marketing Development Manager, and Patrick Lynch, an Irish who’s the Vice President and is now residing here in the Philippines. 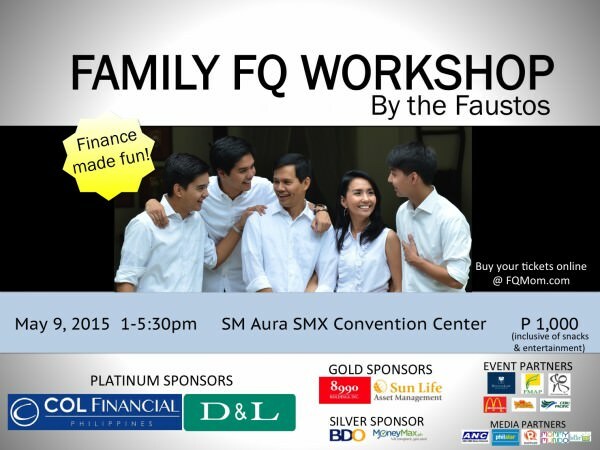 After getting to know more about each other’s advocacies, we became comfortable with each other to become partners in our Family FQ Workshop event on May 9. Moneymax.ph was founded in 2013 with the goal of helping Filipinos save time and money by offering a website that compares financial products, housing loans and broadband internet. 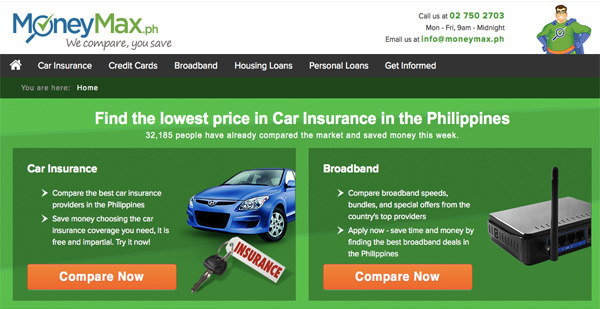 They provide the information they gather from banks and insurance companies in the Philippines. We know that it’s always best to window shop before you make the final purchase and this is also true with financial products. However, unlike window shopping in a mall where you can easily move from one store to the next, doing so with financial products may entail setting meetings with different financial institutions and/or going through each institution’s websites and looking for the features that are relevant to you. Transparent comparison saves you time and money. MoneyMax.ph saves you time by gathering all this information for you and comparing your options side-by-side. Their comparison advisors highlight the difference between the highest and the lowest quotes. Features and coverage information are also provided, so you can choose the deal that suits your needs instead of making a purchase based on price alone. Their service is free of charge.Their site also provides tips on the proper use of financial products, answers to financial questions with the help of their financial advisor partners. They’ve also partnered with media outfits that publish their guides and infographics in order to make financial information easy to understand for as many Filipinos as possible. Click these links: Moneymax.ph or Moneymax.ph FB Page. Non Filipinos see our great potentials. 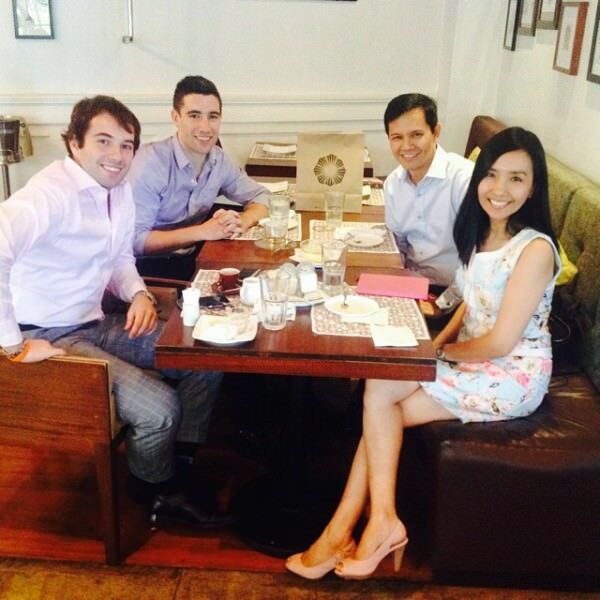 To seal our partnership, we had lunch with Patrick Lynch, the young Irish VP of Moneymax.ph, and Mario Berta, an Italian who’s a representative of one of the company’s investors, and has been working and residing here in the Philippines for a few years now. What’s interesting is that most of the time, those who aren’t Filipinos see the good and the potential of our country more than the Pinoys themselves. And I guess we don’t have a monopoly of this syndrome. Sometimes citizens of a country find it hard to suspend their biased judgment about their government, countrymen, etc. and always act as if “The sky is falling.” This reminds me of a favorite lesson in Philosophy: Epoché – which my Philo professor defined as to “distantiate” from the situation in order to make a better judgment. Epoché is an ancient Greek term, which describes the theoretical moment where all judgments about the existence of the external world and consequently, all action in the world, are suspended. As for me, all through these years as an adult, I try to do even more than epoché about our country. I try to be a Pollyanna. (Pollyanna is the heroine of a 1913 novel who’s very optimistic.) Even if I always recite my “litany” about the garbage, sidewalk vendors and the lack of road discipline and order along Congressional Avenue, I still prefer to live here, grow old here and that makes me want to believe that everything is going to be fine, no matter who the next president will be. Both Patrick and Mario love it here in the Philippines. In fact, Mario gave me a laugh when he said in his Italian accent, “Oh Filipinas, they’re adorable. But they’re probably the best in the world in manipulating their men! I always warn expats I befriend here, but they all fall for them!” And then I noticed my husband laughing in agreement. More than the irresistibility of the Pinay, we also talked about how attractive the Philippines is: the demographic sweet spot, the quality of the workforce, the huge potential of improving the financial literacy in the country, etc.. As an employer, Moneymax.ph already does its share in helping the country realize this demographic dividend by employing 120 people in their Manila office. At the end of the lunch, we all agreed that as we witness the economic growth in the country, we will all help the Filipinos set aside part of that increase in income for the future through our respective financial advocacy channels. Thanks to the internet, I was able to hook up with these people.